I have worked as a personal trainer/coach for over 15 years and have personally trained over 30,000 sessions. 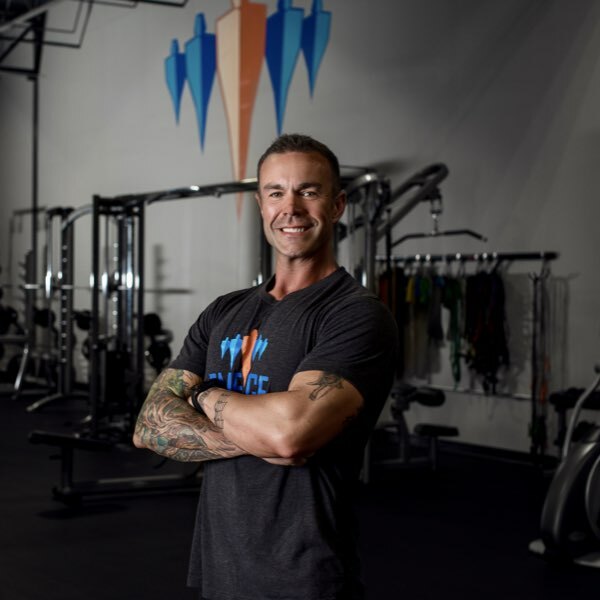 During this time, I have had the opportunity to work with a wide variety of training objectives, from weight loss, to athletic performance, to pain management. Like all of the trainers at Emerge, I am continuously educating myself on technique and theory to help any person who sits in front of me at Emerge realize their fitness goals. With this diverse background, my specialty is in athletic performance enhancement and corrective exercise.. I have trained over 50 professional athletes, including a two time Olympic gold medalist and WWE wrestlers. On the corrective side, I have had great success with pain management and post rehab clients including disc, hip, and shoulder issues. I have worked as a specialist for the St. Louis Rams for their functional training off- season program. Athletes as young as 8 have benefited from our athletic training program, called ATP (Athletic Training and Performance). Check under the “Athletes” testimonial tab for some of the high school, college and professional athletes who have found success with our program. I am also a four-time competition bodybuilder, including 1st place Iowa State Middleweight Champion, and can implement a comprehensive show preparation program for any fitness competitor. My specialties are corrective exercise and sports performance, with an emphasis on core stabilization as an integral part of the program for all goals.